Nitty-gritty. : I AIN'T BUYING IT! I made a mental comparism as I watched how polygamy is practiced here with what I know back home. The 'sister-wives' show is presenting a picture of unity and harmony in a family consisting 21 people! I read between the lines and interpreted the body languages. Now, the first wife has only one child, all her attempts to have more failed, but she is not giving up...the 4th wife told her she would willingly be a surrogate for her ... and I wonder, if they are 'one' as they want the audience to believe, why want more? Why not simply accept her step-children as hers? Oh! Very simple! My own, Your own, Our own, is different! The 3rd wife has only 1 son and 5 daughters, the 2nd wife has 4 sons and 2 daughters, and the 4th wife gave birth to a son as her first child for their husband and the 3rd wife was thinking of going for baby 7 hoping it would be a boy ... and I ask why? Jealousy maybe? The 4th wife was a divorcee with 2 children from a monogamous marriage, and I wondered, how she was going to make it work this time around when she has to share ONE man's affection with other women? The 3rd wife was hurt when her husband married the 4th wife who is a trophy wife because of her looks...yeah, she is the prettiest amongst the wives.. followed by the 1st, 3rd and the 2nd wife...who went to the gym to reduce her weight after the 4th wife came in...is that not envy? ... and when asked if he would allow his daughters to go into a polygamous marriage ... he hesitated a teeny little bit to gather his thoughts and said yes with a lots of IF's ... that emulates his own kind of person, and I thought why the hesitation in the first place? Why not an enthusiastic YES! ... maybe he exhibited the fear of every parent concerning their daughters and future son-in-laws? ... and one of the daughters said she would not go into any polygamous marriage ... w-h-y? ... so you see the reasons why I ain't buying it! 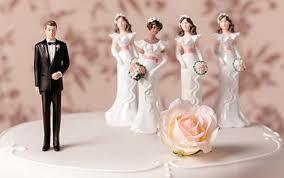 I dislike polygamy! Yes! I know, certain religion approves of it as our culture does, and part of the old testament did. But I personally do not see any good it does to the women, except ONLY the man who gets all the fringe benefits! Imagine a family of 4 women and 16 children with different personalities veering for ONE man's attention and affection, and there would not be bickering? pettiness? jealousy? competition? grudges? conspiracy? fights and whats not? What about the expenses? All the wives are working and contributing their quota to the upkeep of the home... I can imagine the pile of debts this family would be paying through out the days of their lives for mortgage, insurance, medical and college! In all sincerity though, the husband in this TLC show was fair in his dealings, but I refused to believe he won't prefer one of them most ... personally, I like the 4th wife looks more ... and the 1st wife calm- maturity. The difference with polygamy in 9ja and yankee is that structures and facilities are in place to make the family comfortable ... and probably happy? ... But am still ain't buying it!